Quebecor’s Videotron launched its Wireless network recently (Sept 9) and we took the opportunity to review its cell phone plans which they recently introduced. Unlike the new entrants, Wind Mobile, Mobilicity and Public Mobile – Videotron is an established cable operator with over 2.5 million customers already and with the necessary financial resources to do this (so they can’t be bought out). – What if I’m not a Videotron customer already? 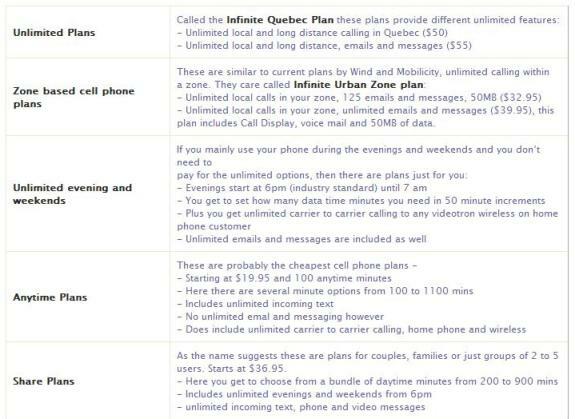 Then your options drop considerably, you still have access to the unlimited Quebec Plans but they start at $60, that’s $10 more than those who have 3 services with Videotron. In fact, everything is about $10 more if you are not already a videotron customer. So these plans are specifically targeted at Videotron’s own customers. Videotron’s cell phone plans are different, unique and very interesting. To truly receive the benefits of their discount pricing you need to be Videotron customer with 3 other services ideally. There is the expectation of a commitment via contract or bundled service contract. The inclusion of data at the lower price point plans is very innovative and daring, but they do include some quirky elements like the 125 email limit for some of these same plans. It will be interesting to see how the non Videotron customers react to some of these plans if they do at all, but I know that their existing customer will definitely jump on these plans. What do you think about their plans? If you liked this post share it with your friends or leave a comment with our community, we love hearing from you.